Directions to Motorsports Garage, Ltd.
2. Take the I-93 S exit- exit number 40A- towards BOSTON. 3. Merge onto I-93 S.
4. I-93 S becomes US-1 S.
6. Keep RIGHT at the fork in the ramp. 7. Stay straight to go onto ramp. 8. Merge onto I-90 W (Portions toll). 9. Take the exit- exit number 20- towards BRIGHTON/CAMBRIDGE. 10. Keep LEFT at the fork in the ramp. 11. 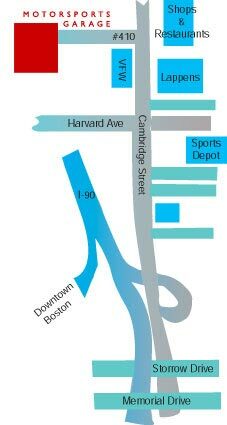 Merge onto CAMBRIDGE ST.
2. MA-3 N becomes US-1 N.
3. Take the MASS. PIKE exit towards DOWNTOWN/CHINATOWN. 4. Keep RIGHT at the fork in the ramp. 5. Merge onto I-90 W (Portions toll). 7. Take the exit number 20- towards BRIGHTON/CAMBRIDGE. 8. Keep LEFT at the fork in the ramp. 9. Merge onto CAMBRIDGE ST. Hosted & Maintained by Greatson Media.